Many fans believe that a Jedi's lightsaber color has to do with their powers or personality. But that's not the case. Especially when it came time for George Lucas to pick out the color for Luke Skywalker's new lightsaber in Return of the Jedi, after he lost his father's old blue one in Empire Strikes Back. The bright green blade had nothing to do with Luke's prowess, nor just how strong he was with the force. There was a much more pragmatic process behind the decision. Luke's original lightsaber meant a great deal to the young Jedi. But he could never call it his, as it didn't exactly call out to him. And he didn't make it himself. He was gifted the lightsaber by Obi-Wan Kenobi in 1977's A New Hope, which celebrates its 40th Anniversary today. In the Star Wars canon, that lightsaber isn't considered 'Luke's lightsaber'. Luke's official Lucasfilm branded lightsaber is the green one. Because, as Jedi are required to do, he built it himself. In fact, there is a cut scene from Return of the Jedi that shows Luke constructing the lightsaber from Kyber crystals. 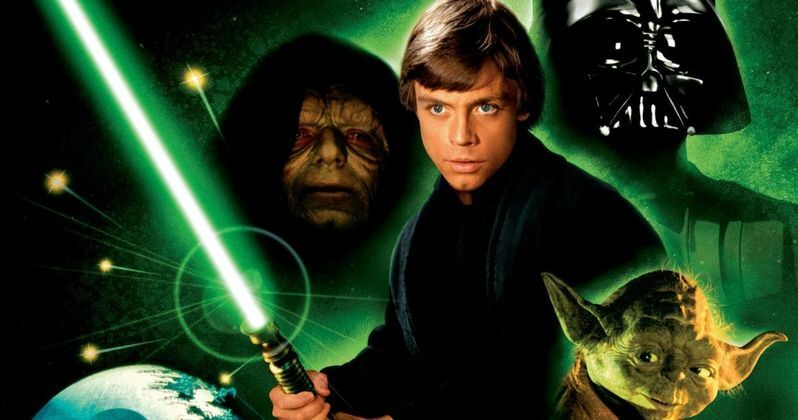 The green weapon very much impresses Darth Vader when Luke meets his father again heading to the second Death Star looming high above the forest moon of Endor. Kyber crystals and lightsabers are hard to come by after the Jedi were wiped out by Anakin himself as part of Order 66. But in a new expose as part of Vanity Fair's big The Last Jedi issue, Lucasfilm Story Group creative executive Pablo Hidalgo reveals that Luke Skywalker's personal lightsaber was always supposed to be blue. And it was shown as being blue in the original teaser trailer and poster, when the movie was still being called Revenge of the Jedi. But the blue lightsaber was causing a problem for the opening act of the movie. Sure, Luke is on Tatooine when he receives his dad's lightsaber from Obi-Wan. But we never get to see him use it on that desert planet outside in the sunlight. In Return of the Jedi, Luke must use his lightsaber to save Han Solo from the clutches of Jabba the Hutt, which called for some cool fight scenes on Jabba's sail barge. Problem was, the blue lightsaber was blending in with the beautiful blue skies of Tunisia, and other colors weren't fairing well against the sandy landscape. But the green color really popped. Says Pablo Hidalgo about the change. "The intent was the lightsaber was going to be blue. In that universe, at that time, as far as anyone knew, lightsabers were red or they were blue. As much as we like to mythologize why it's green and what that all signifies, sometimes there are very pragmatic filmmaking reasons behind these things." So, green was chosen because it looked most striking against the blue sky and tan color of the sandy dunes. Something else very similar happened when it came time for Samuel L. Jackson's Jedi Mace Windu to get his lightsaber color. Hidalgo explains that Samuel L. Jackson insisted on purple, for the sole reason that audiences could pick out his character in the Jedi-heavy fight scenes included in Attack of the Clones. "George [Lucas]'s rule of thumb was bad guys get red, good guys get blue, or, eventually, green. Lo and behold a purple one came into existence." Over the years, fans have tried to find some meaning to the various different lightsaber colors and what they represent for each Jedi. But there is no stated purpose to any of it beyond helping the film obtain a striking visual look. Hidalgo says that the color of a lightsaber blade should not be indicative of a character's morals. And that this isn't like the Sorting Hat in the world of Harry Potter. So far, Luke's green lightsaber has not made a return in any of the marketing materials for The Last Jedi. And it hasn't been revealed if he'll brandish it yet again in a fight against Snoke and Kylo Ren. It has been revealed that Luke now uses a walking stick, much like Yoda did when we first met him in Empire. And Luke may use it in a fight against a greater foe than he's ever encountered before. But Hidalgo hints that Luke hasn't 'lost' his lightsaber. "We take to heart the lesson that Obi-Wan tried to impart to Anakin: 'This weapon is your life.' We're not ones to lose track of lightsabers." That sounds like the old green lightsaber will be back in The Last Jedi, but we'll have to wait until December 18 to find out for sure.